The Chariot is the triumphal card of the tarot. To be victorious, you must have unwavering confidence in your cause and never lose focus of your purpose. This card holds a lot of energy, though not in every direction—for the Chariot, the only way to go is forward and towards success. The Chariot is a proud, commanding figure. When the Fool meets the Chariot, they have a discussion of what willpower means. Being in control is what the Fool most desires. The Chariot assures the Fool that developing an inner control will allow you to triumph over your environment. But remember, the Chariot tells, success is only the beginning and not the end of your goal. The Chariot often represents the union of opposites—like the sun and the stars. Pull all the energy of your life, whether help or obstacle, into one force towards victory: that is the message of The Chariot. 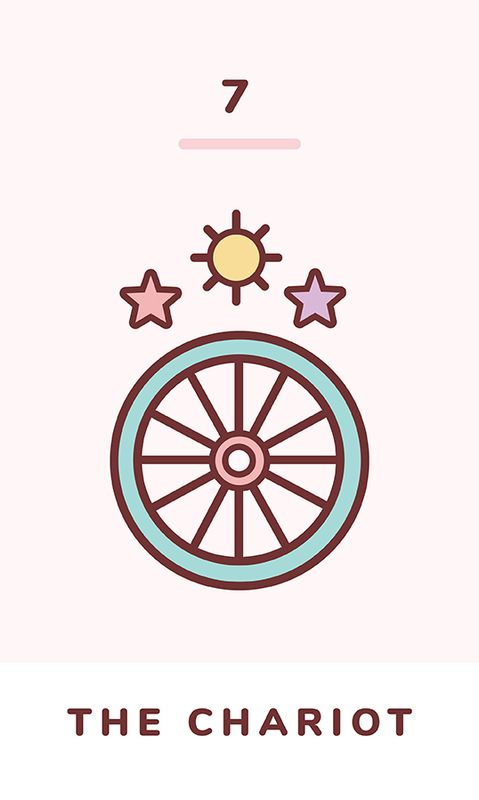 In a reading, the Chariot is a sure sign of upcoming and earned success. Although it may be a struggle, this is time to develop confidence and control. Your drive will be rewarded by divine forces. The Chariot has aggressive energy that cannot last forever, so consider this time more of a sprint than a marathon. Make victory non-optional. The Chariot is a positive sign in health and work. Even when not upright, the Chariot is always a sign of victory. If you receive the reversed Chariot in a reading, it could be a sign that a lack of confidence is what’s blocking your success. This card reversed can also suggest that you feel you have lost control of your life, like you are not the one driving anymore. It’s time to tighten the reins. Change what you can in your life through discipline and willpower. What you can’t change is not worth your worry. The Chariot reversed may also suggest that you should relinquish control and be more comfortable with spontaneity and new experiences. This card is a burst of strong energy that cannot last forever. Letting someone else steer will result in better health for you. The Chariot reversed could also signify that you waited too long to make a decision.